An exceptional home with outstanding finishes throughout. Exposed beams, diamond plaster walls, nichos and stone floors exude Santa Fe Style. Located on a private lot, this house is surrounded by mature landscaping and mountain views. This single level property offers a thoughtful and inviting floorplan that encourages entertaining. The large kitchen opens to two outdoor dining areas one to the East and one to the West. The Main House has two guest bedrooms both with en-suite bathrooms well separated from the Master Suite. The spacious Master Suite includes a cozy kiva fireplace, a sitting area, two bathrooms and private portal complete with an outdoor hot tub. The guest house includes a full kitchen and kiva fireplace. 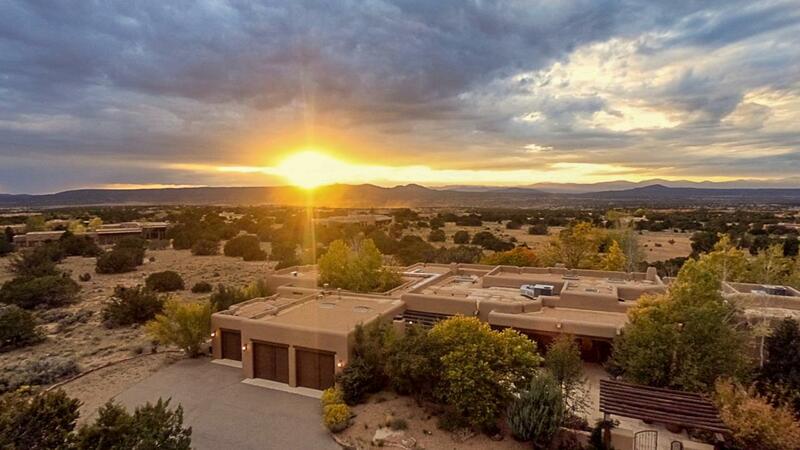 Imagine a cozy Santa Fe evening with a glass of wine, a Santa Fe sunset and the smell of pinon in the air. This turn-key property could be yours. Directions To Property: Las Campanas Drive Then Left Calle Chirpa, Left On Calle Ventoso West, Right On Entrada Descanso, Poroperty Is The Second House On The Right.